ST. PETERSBURG, Russia, November 22, 2010 (ENS) – To help secure the future of Asia’s critically endangered wild tigers, the Wildlife Conservation Society today pledged to spend $50 million over the next 10 years – $5 million of the total during the next year. Dr. John Robinson, WCS chief conservation officer and executive vice president for conservation and science, made the commitment at the International Tiger Forum in St. Petersburg, a unique four-day meeting that opened Sunday. “Private individuals and private foundations are also making crucial commitments to tigers, such as those of the Liz Claiborne and Art Ortenberg Foundation which has put tiger conservation as its highest priority, and collaborating organizations like Panthera,” said Robinson. Based at New York’s Bronx Zoo, the Wildlife Conservation Society has more than 50 years of experience working for tiger conservation. Hosted by Russian Prime Minister Vladimir Putin, the International Tiger Forum is unprecedented. For the first time, world leaders are coming together focused on saving a single species. Ahead of the forum, officials from the 13 tiger range states had a series of ministerial meetings and each of these countries wrote its own tiger recovery program. The 13 countries took more than year to write a Global Tiger Recovery Programme, which sets forth a comprehensive set of actions to help the world’s 3,200 remaining wild tigers recover from decades of hunting, poaching and clearance of their forest habitats. The Global Tiger Recovery Programme aims to at least double the number of wild tigers to a target of 7,000 animals by the next Year of the Tiger in 2022. Heads of government and ministers are meeting in St. Petersburg to endorse the plan, which is estimated to cost $350 million for the initial five year stage. “We know what’s causing the decline in number of wild tigers: It’s illegal poaching, trafficking, lack of habitat,” said Zoellick. So, the World Bank is supporting development of this tiger recovery effort from the bottom up with the 13 tiger range countries. “Together with our partners in civil society and elsewhere, the World Bank Group aims to support the tiger range countries in achieving the goal they’ve set,” Zoellick said. Because tigers don’t recongize national borders, Zoellick says resolving regional trans-border issues is important. On a visit to China last year, he was able to start to work with the State Forestry Administration on creating a preserve in Northern China that would allow a wider range area for the Amur tiger that crosses the Chinese-Russian border. Nepal has already tried to create corridors among some 11 national reserves to create the opportunity for growth and expansion of its tiger populations. There has been collaboration between India, Nepal and China on law enforcement and, in the case of Nepal and India on protecting the tiger populations they share. “WCS is focused on offering technical assistance and support, both financial and logistical, to our partners in tiger range states,” Robinson said today. To date, he said, WCS has responded to commitments from tiger range countries to conserve the tigers in Cambodia, China, India, Indonesia, Lao PDR, Malaysia, Myanmar, Russia, and Thailand. “We are committed to providing this support and assistance at those landscapes prioritized by range states. Most of these contain source sites, nationally important parks and reserves that contain core breeding populations of tigers, which are embedded in larger tiger landscapes, and thus act as sources for dispersal throughout those landscapes. Quick action is essential or most of the world’s wild tigers will be gone within a year, warns James Leape, who heads the global conservation organization WWF. 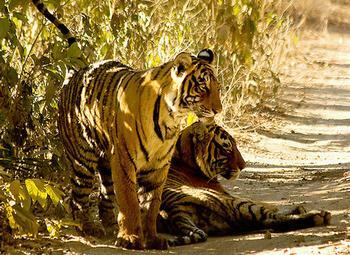 The threats to tiger survival are many. A new report from the wildlife trade monitoring organization TRAFFIC shows that black markets along Myanmar, Thailand and China’s shared borders play a crucial role facilitating the illicit trade in tigers and other endangered species. A joint WWF-TRAFFIC report released November 9 shows that parts of at least 1,069 tigers have been seized in tiger range countries over the past decade. 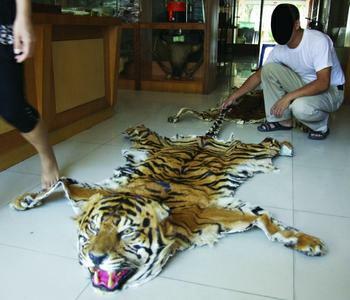 The report, “Reduced to Skin and Bones,” shows that from January 2000 to April 2010, parts of between 1,069 and 1,220 tigers were seized in 11 of the 13 tiger range countries – an average of 104 to 119 animals per year. Of the 11 countries, India, China and Nepal ranked highest in the number of tiger part seizures, the report states, with India by far the highest number of tiger part seizures at 276, representing between 469 and 533 tigers. China, with 40, had the second highest number of seizures, or between 116 and 124 tigers; and Nepal reported 39 seizures, or between 113 and 130 tigers, according to the report. 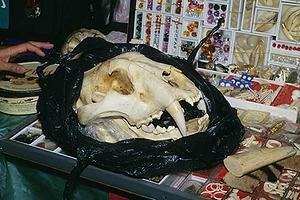 Tiger parts reported in trade ranged from complete skins, skeletons and whole animals – live and dead – bones, meat, claws, teeth, skulls, penises and other body parts. They are used for decoration and in traditional medicines. In Myanmar, or Burma, the Kachin Development Networking Group has been monitoring the world’s largest tiger reserve in the remote Hugawng Valley since 2007. The organization reports that reserve is being clearcut for sugar cane and tapioca plantations by Htay Myint, one of the country’s most powerful tycoons. Htay Myint’s Yuzana Company has brought in fleets of bulldozers and backhoes that “have been razing forests and destroying animal corridors, leaving only the conservation signboards standing,” the Kachin Group says. “The reserve was established in 2001 with the support of the US-based Wildlife Conservation Society. 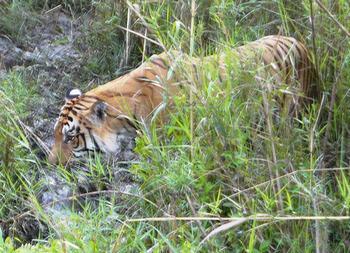 However WCS has remained silent on this destruction of the reserve and has claimed that Hugawng Valley will be a cornerstone of tiger conservation in the future,” says the Kachin Group. Still, Robinson of the Wildlife Conservation Society struck an optimistic note today in announcing the organization’s $50 million committment.